Open space house (130m2) with a contemporary approach combining traditional Portuguese architecture: kitchen, living room, dining room and 1 double bedroom. Close spaces: 1 single bedroom, 1 bathroom, washing and storage area. Organic pool (30mx10m). Private garden with green grass 300m2 area, balcony, terrace, patio area, greenhouse with garden furniture for outdoor dinning, seating area and barbecue. Sightseeing, nature tourism, outdoors, birdwatching, historic, active, sun, lagoon, beach, golf, footpath. 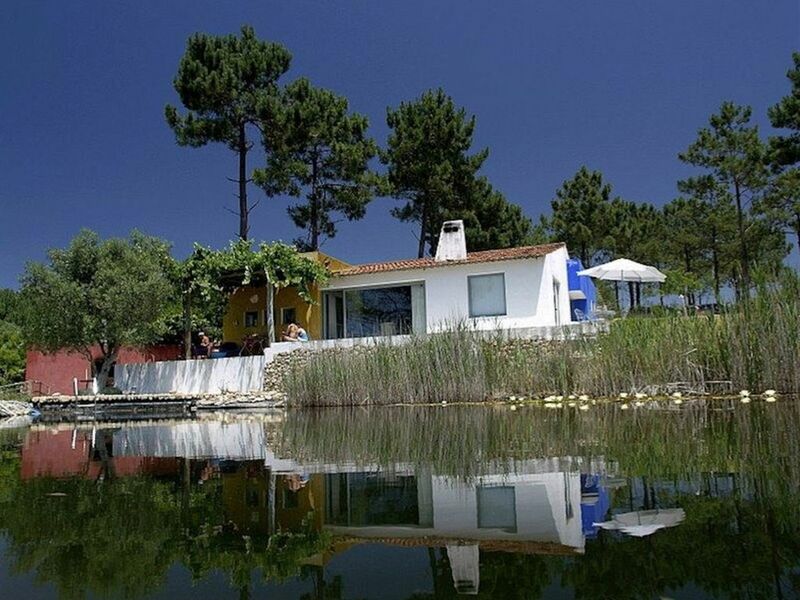 At 10 minutes from Caldas da Rainha city center and A8 road. At 15 minutes from Foz do Arelho beach and 30 min from desert beach. It resulted from a design-thinking approach to creating a self-sustainable system by Implementing organic farming, organic pool, rustic garden, restoration of grassland and vegetation cover through autochthonous varieties, pine, oak, olive trees, vineyard, orchard, vegetable garden and gases . PROPERTY TYPE Catering Bassis self-catering Floor area (m2) (130-150) Theme: sightseeing, nature tourism, outdoors, birdwatching, organic farming, active, sun, lagoon, beach, surf, kitesurf, historical zone, footpath, bycicle, golf, meditation, arts. OUTDOORS AND GARDEN Garden Summary: private garden, balcony, terrace, patio area Pool: organic pool / Pond (30x10m = 300m2) Outdoor Amenities: barbecue, fire place, shaded area, outdoor dinning, seating area, garden furniture, organic meadow, green grass area (400m2) pine forest, kitchen garden. And I enjoy to have you as guest. You left everything in order and clean as do the kind families. Thank you for choose Okecasal! Beautiful place at a perfect spot on the laguna of Obidos. This house would be one of those places you don't want to review, simply to keep it secret; it was so good, calm, heavenly, quiet, green, warm and charming. We wish to come back there soon! Thank you Maria João for being such a good host! Absolutely amazing, our dream holiday/home! The house is a design dream, with all comfort and style. The Eco swimming pool was heaven, swimming with the fish and kingfishers visiting daily. As if that wasn't enough it all overlooks Obidos Lagoon with sensational view through the huge lounge window and the many varied spots to sit outside - under the vines, from the pool and the lovely barbecue area. On top of that Maria was very helpful and the house was fully equipped as a home, all household items provided and lots of lovely design books and magazines to read. Wonderful and spacious house in a beautiful spot. The house is well-equipped. There is really everything you need. The view is beautiful and there is a lot of space around the house to relax or harvest fruit. The beach at Óbidos Lagoon is beautiful and you can even go for a swim there. The small city of Óbidos is also a very special place (beautiful but a bit crowded) and worth at least one visit. In Caldas da Rainha you can find a lot of nice restaurants. If you have a car you will really enjoy the place! I really recommend to stay at Marias house! Obrigada Katrin pelo seu gentil comentário e por ter deixado a casa tal como o encontrou. A Katrin e os seus pais são o tipo de hóspedes que dão prazer ao anfitrião em receber. Traumhafte Kulisse, wunderschöne naturbelassene Gegend (Naturschutzgebiet) und offenherzige, gastfreundliche Menschen (über ein/zwei Wörter in portugiesisch freut man sich sehr! aber kein Muss). Wir haben uns gleich sehr wohl gefühlt, haben am ersten Tag gleich mal über 12 Stunden durchgeschlafen - was sehr selten auch im Urlaub bei uns vorkommt. nach ca. 15 Fahrminuten ist man auf der neuen Autobahn - super zum fahren - Lissabon, Peche, Obidos (Restaurant vorher nach Empfehlung aussuchen - da sehr touristisch) und Nazare sind sehr zum empfehlen. Wir kommen gerne wieder und hoffen das nach dieser Empfehlung noch etwas frei sein wird. Dieser Kommentar ist fast unerträglich. Der nächste Besuch wird noch besser, weil ich in ständiger Verbesserungsprozess bin. It is a property Consisting of a plot of 161. 458.66 square foot (15 000m2 - 300mx50m) between the National Forest Reserve and the National Ecological Reserve (REN).